For this month’s “How I Wear My” post, Adrienne of The Rich Life (on a budget) and I thought we’d pay tribute to the simple scarf. Scarves inspire such passion in the people who love them but how do you choose your favorite? 70 cm Le Boubou H in the bleu indigo/blanc/ciel colorway. I thought I’d have a tough time with this but it turned out to be a piece of cake. This is my 70cm Hermès silk scarf called Le Boubou H, by Karen Petrossian, in the bleu indigo/blanc/ciel colorway. “Boubou,” from what I’ve read online, is a traditional African tunic embroidered with symbols, which explains why Le Boubou H is heavy on Hermès charms—a horse’s head, the Kelly bag, and the horseshoe, among others. A horse was destined to make its appearance on a scarf of Hermès symbols. A Kelly bag. Hope it's a good luck charm for me. I was drawn to this scarf mostly because of all the glorious shades of blue but also because I love how, as soon as you start to wrap it around anything, all the symbols and designs look like animal print. This scarf is another instance of my seeing something in a shop and then going home to think about it for a long time. I saw it in January of 2011 and then took a full year to think about whether to buy it or not. When I realized that I still really wanted it, there was only one left in this colorway in the entire United States. In Denver. I snapped it up before it was gone and I love it more now than I did when I first encountered it. A horseshoe and initials of the artist, Karen Petrossian. My grandmother loved betting on horse races and a horseshoe became her good luck charm. There was a horseshoe over the door leading from the garage to her house and she wore one on her hand too, in white gold set with diamonds. Whenever I see horseshoes I think of her and because there are two horseshoes on Le Boubou H, I’m inclined to think of this as my lucky scarf. Self-portrait in front of Grand Army Plaza. This scarf is great with a black trench. I never get tired of a great scarf! The upcoming summer travel season is on our minds, so along with packing just enough of the right things to take on vacation, we want to talk about what to wear when you leave on your trip. Join Adrienne and me on June 5 for “How I Wear My: Chic Traveling Outfit.” We’d love to see what you wear when traveling by plane, train, automobile, or cruise ship! Know some secrets for mixing comfort and style? Have an unbeatable travel outfit tip? Please share with us! And do stop by The Rich Life (on a budget) to see how Adrienne and others wear their scarves! That is a great scarf. It's a great way to add more colour to an outfit and close to your face. I should really participate in this challenge. I have so many great scarves from long ago but never wear them! Love that last picture, Jill. 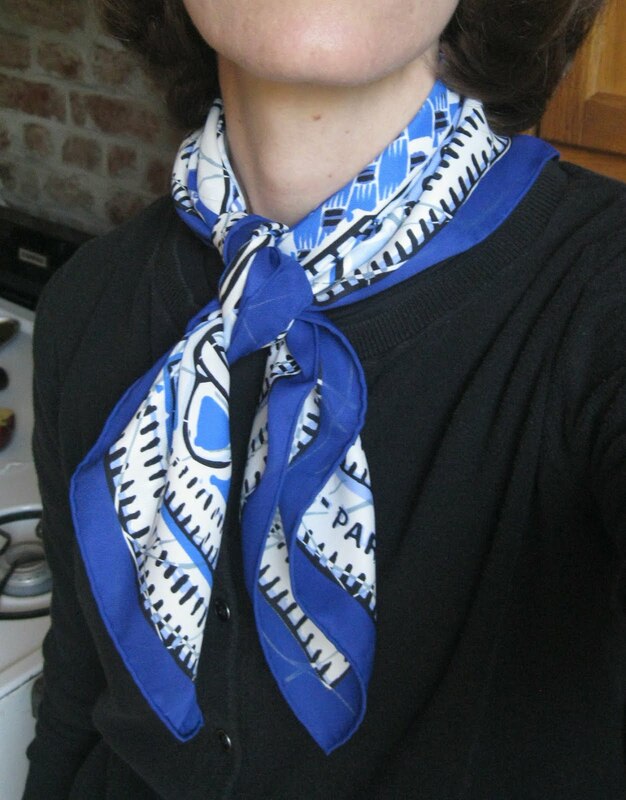 The scarf just brings out your eye color beautifully!! I love horses, so this really speaks to me, and of course, Hermes...need I say more? I'm not into scarves but this one is absolutely gorgeous. What a unique and beautiful scarf. I am so glad you were able to get your hands on the last one. That was cutting it very close! I am seeing that scarf in a whole new light now that you've shown us the details. What a fun post for May! I am already looking forward to next month's feature. This is a great idea for a post. Wish I caught it in time. I just bought a new scarf this last weekend where I'll be coordinating orange and white together. Maybe I should post it later this week. Like your blog! I love the associations to your grandmother you make with this beautiful scarf. I'm really gonna have to think a bit about a travel outfit. So much of our travel is good old-fashioned road trip. OH I adore scarves, and yours is beautiful with such charming prints. It was definitely a great buy! It's lovely to see the close up shots of it in detail. I'll be sure to join you on your next event in June that's right up my alley. Have a wonderful week Jill. Sorry I missed this one but you know I never know what to do with scarves - chic ladies like you seem to wear these with such grace and ease - I always feel like I'm being strangled!! And it seems I'm swaddling my neck in a warm wooly winter scarf for 8 months out of the year here! From one scarf enthusiast to another...I would like to share Charm Scarves with you. They are a scarf and necklace combined. And the coolest scarves I've seen to date. I have a business selling these scarves to help ladies reinvent their existing wardrobe and I think you'll love them. They are meant to be worn in several different ways and I am interested in your thoughts. Please check out www.chicmodish.com. Thanks!! This scarf is perfect with your eyes. You are beautiful, Ms Jill.